from blank pages...: Giveaway Day!! Today I'm going to offer up a pattern bundle. I'll leave the giveaway open until May 10th at 7pm Central time. Make sure to leave your email or a way to contact you if you win. If I can't get a hold of you, I'll pick someone else. My favorite quilting book is Modern Quilting by Jacquie Gering and Katie Pedersen. I just find it so inspiring! I follow you via email. 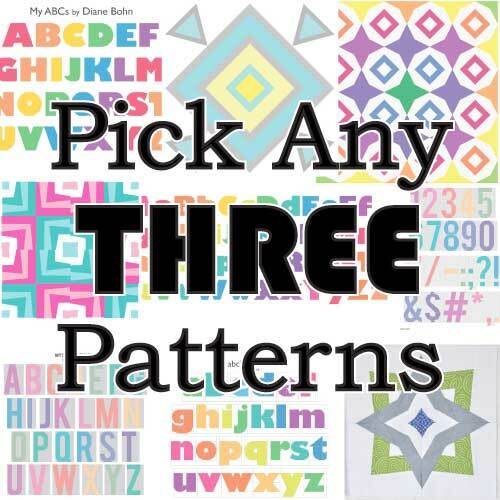 I'm excited about this giveaway--I have purchased your first alphabet and would love to add some more of your great patterns. My favourite pattern to date, is Butterick 5285, a skirt pattern. I made it recently, and was thrilled with it! I love the D9P so versatile! And so quick and so easy! I've added you to my bookmarks and I'm now a follower! I love the Dare To Be Square book but there's so many great patterns it's hard to pick one! I love the log cabin pattern, it's what inspired me to buy a sewing machine to learn to sew. My favorite quilting book is one based on a children's book, the Quiltmaker's Gift. The quilt book is Quilts from the Quiltmaker's Gift. Both are great books. i use the raglan tee pattern from Sewing for Boys all the time. love it. I love Jaybird Quilts Come What May quilt pattern! But i just popped over to your shop and am in love with all your lettering patterns! So far my favourite quilt pattern is Swoon! The Hunters Star is one of my most favourite. I'm in love with paper piecing, but my favorite quilt pattern (so far) has been the wonky star). Thank you for a great give away! I don't use much patterns but now I have started to paper piece and would love to make your letters! I follow you by blogger and Bloglovin! My favorite shirt pattern is a swing top. It's so versatile and forgiving! Gotta love that! I love the log cabin block. It isn't really a pattern but a starting point for a wide variety of patterns. That's what I like about it -- traditional or modern depending on what you do with it! I love Amy Butler bag patterns. I really love the Ava Rose tote bag pattern, found on etsy. Thanks for a chance to win. Following via GFC & Bloglovin. Thanks again. I love the Single Girl Quilt pattern A LOT! My favourite pattern is Circle of Flying Geese. They are just so satisfying. I have a Japanese book of "Ugly Monsters" that I love making kids from fun socks. Thanks! I love Sunday Morning Quilts because I am a scrap lover!!!! Thanks for the great chance to win! I love the Swoon pattern! I am following you by RSS, Twitter, and various other outlets. Thanks for the bonus entry. My go-to quilt block pattern is the sawtooth star, because it's easy to do the math to make it any size and there are so many variations. The day that Google announced reader was going away, I switched to Feedly, so that's how I am following you now. I follow you on Google and will until it goes away. Yay for your giveaway and back to normal comments!! I LOVE your patterns and my fingers are crossed!!! Thanks for the chance! I follow you by GFC and Bloglovin. Wonderful giveaway ! I like the twister tools. I really like half square triangles, there's just so much you can do with them! I also half to tell you I never paper pieced before I bought your 'my first alphabet' pattern and now I'm totally hooked! Was very intimidated by the S but it turned out awesome. Thanks for the great pattern! The swoon quilt is a pretty fun one in my repertoire. I love the Urban 9-Patch pattern! I love Log Cabin patterns, forgiving for a newbie like me. I would love to make myself a swoon quilt one day! I have a vintage bell-bottom pattern for kids that I have used many many times for my daughter. LOVE IT! Right now I'm working on a Large Block Chevron quilt and loving how quick it works up yet quite striking to look at. My daughter would love your LOVE pattern for sure!!! Thank you for your giveaway and congrats on the new little one!! I really love The Road to Tennessee on Moda Bakeshop. Thanks for the giveaway! I just bought the book Pillow Pop by Heather Bostic & others & I literally want to make every pillow pattern in the book! Really & truly EVERY pattern! It's such a great book. Thanks for the lovely giveaway. My favorite pattern is Swoon and the Weekend Bag. Thanks for the chance. I follow your blog through my RSS Feeder. Thanks for the chance. I favorite pattern right now is swoon, I am currently picking out fabrics for it. I follow you on Feedly. Thank you for the giveaway! I just love half square triangles and always go back to making them. I read all blogs in bloglovin. I think Google Chrome, I'm getting confused about what some of these programs are. I think I tried to leave a comment the other day and it wouldn't open the box. I don't have a favorite pattern. I just love to make stuff. I follow you by e-mail and bloglovin. My all time favorite is whatever I am currently working on. Recently I made a block I really enjoyed but of course I can't remember the name of it! I haven't used that many patterns so I don't have a favourite, but I enjoy all sewing it could be anything! Thank you for offering the giveaway. My favorite pattern is actually 2 books of them - Schnibbles Times Two, and Another Bite of Schnibbles. I love dresden plates and log cabins. Fantastic. I think I love a log cabin pattern as my Grandmama made me that for me. Super special. I'm entering again just in case, I follow you and had no problem the first time around in writing a comment, but I love your ABC's. I still have a book from the 70's called, "If I didn't Have to Wear Clothes". Some of the styles have made acomeback through the years. They're very groovy. Todos sus patrones del alfabeto me encantan. El bebe es adorable .Que suerte que ya esta en casa! Soy su seguidora por correo electrónico. I follow you on the sidebar of my blog, have done for ages now! I have made prom dresses for my daughters. The patterns I used have to be favourites! I'm enjoying the different patterns that use a disappearing nine patch. I'm following you on GFC. Thanks for a wonderful giveaway! I have an Amy Butler Dress pattern that I've made a MILLION copies of! I really like the quilts in Modern Patchwork by Elizabeth Hartman.